You can count on certain things when you know Dave Bainbridge is involved in a project. One of those things is quality. I've never seen him attached to anything that isn't top notch. Another thing you can pretty much assume is that you'll get progressive rock with a healthy helping of Celtic music in the mix. Both of those things hold true here. This new DVD features a number of Iona songs along with songs written by these two artists and Bainbridge solo compositions. They are all performed in studio. While the two musicians handle some of the tracks live, at other times they are joined by backing tracks and vocal loops. 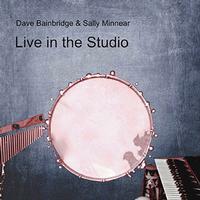 I love how those vocal loops allow Sally Minnear to do harmonies with herself. She's an amazing singer with a lot of range and impeccable ability to always hit the right note. So, when she harmonizes with herself you can expect magic, and she delivers. At other times backing tracks allow for a full band treatment with just the two musicians playing live. I should mention that Bainbridge plays a number of stringed instruments along with keyboards while Minnear provides percussion, more keys, guitar, whistle and violin. The video and audio is top-notch, too. It is a rich sound, really. If that were all we got here, this would be well worth having. They included more, though. First, there are some tracks recorded live in front an audience. While the sound quality on those is great, the video is a bit grainier than the video on the main feature. Still, this is a bonus, and it sounds great, so who's complaining? There is also a conversation between the two about how they met and started working together and more. It should be noted that while Bainbridge is probably the more well-known member of the duo, Minnear has quite an impressive resume, in addition to being the daughter of Gentle Giant's Kerry Minnear. It's no wonder she's so talented. The apple didn't fall far from that tree.